As I was trying to catch up on my emails and reading list from the last two weeks, I found out that Paige from The Creative Paige featured my Save the Holes post. Thank you, Paige! I'm so lucky! Kelly at Blue Bird Sews featured my upcycling of Chloe's dress into a shirt this week. Thanks Kelly! When it comes to birthday parties, (or any kind of party, really)... I get a little excited! My son's birthdays are all within two weeks of each other in April and May, so pretty much as soon as Christmas is over I start planning. (OK, not really that early, but I do get things going in my head quite early). Today I want to share with you some ideas we used last May for a joint party for my 8-year-old and 5-year-old. We chose an Angry Birds theme since they (and their Dad) love this game. Five months ago, there wasn't much out there you could buy around this theme. Now, I see toys, games, and clothing all over the place. (Have you seen this costume idea? It's probably a good thing I didn't see this until recently. So fun.) We had to come up with most of the party decorations, favors, and games, ourselves, but that was all part of the fun. I had drawn out a pattern for each bird on colored card stock that I was just starting to cut out when I found this free printable, so I used it instead. It looked better than what I was free handing anyway. I free handed the outline and used the face from the printable again. The party details were on the back (image above). You might have seen these cupcakes from the Crafty Chicks website. 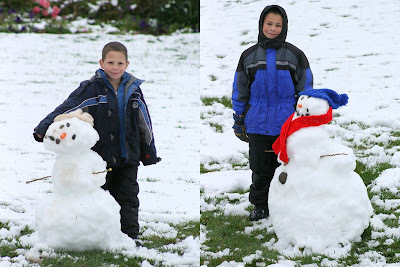 They were so fun to make and the kids loved them. We also had bags of popcorn and lemonade for the kids to enjoy. This was the funnest part of the party. We stacked lots of cardboard boxes in different formations with a few pesty pigs (green balloons with faces) hiding in between. Then the kids took turns hurling balls (with bird faces) at the pigs. I was amazed at how long this kept them entertained. Build a tower, knock it down. Repeat. Repeat. and these fun key chains. I made them using a similar technique as described here (I use Glossy Accents rather than Diamond Glaze). Also, rather than use scrabble tiles, I wanted something bigger, so my brother cut these wood squares for me, which measured about 1 1/2" x 1 1/2". I found the graphics online and put a character on both sides. Then I screwed in the key chain parts that I purchased from JoAnns. (If you want more details on how to make them, just leave a comment or email). Where to begin? First, we made these figurines from polymer clay and used Jenga blocks for their battleground. In this picture I used sticky-tac to set things up for a picture. The boys were really excited about these and helped me create each character and make sure they looked like the real thing. Next up were these shirts that my sister, Kimberly helped me make. The boys opened them the morning of the party. I used felt for the birds and sewed them on the shirt (thankfully all the shapes are pretty much basic circles, triangles, etc.). Kimberly cut the words on freezer paper using her Cricut and then I painted them. (Cheri at I Am Momma Hear Me Roar explains this really well here). They were made with much love, laughter, and a little frustration (when I sewed a face on the wrong side, or make a head oblong with too much stuffing). My Mom is awesome at this kind of stuff. I had planned on just showing her the characters from the game and seeing what she could come up with, but we actually found this tutorial which helped immensely! She and I stayed up until midnight every night working on these babies when I took the kids to Idaho to visit during our Spring Break. It was a fun party and the boys are still talking about it. If you want better descriptions of anything mentioned above, just let me know. Thanks! Boy, do we wish we lived closer to Leslie as she throws one awesome birthday party! Thanks for sharing, Les! How many of you have "distressed" jeans in your closet, or bought a new pair of worn out jeans for your kids this year? When we were having our back-to-school fashion show, Bill was not too happy that Cheyenne and Natalie bought matching jeans with holes in them. He felt a little better when we told them the were on sale, but we still got a big eye roll. :) Anyway, at both their schools, it's against the dress code to wear clothes with holes in them - the half holes are okay, but when it gets to showing skin, it's not, I guess. So I decided to take preventative measures. I bought a package of iron on patches from Walmart, cut out close to the shape, and following the instructions on the package ironed them on to the INSIDE of the pant leg. This does two things, 1- it provides a backing to the hole, of course, if the threads start to break, 2 - it also sticks to the threads, hopefully keeping them intact longer, or if they do break, they'll stay in place and you won't notice anyway. After ironing, you could stop there, but I wanted a little extra insurance, so I turned them right-side-out and stitched around each hole, too. That will keep the whole from fraying more and getting bigger. You can only notice the stitching if you're really looking for it. Great way to let those jeans be worn a little longer. I'd love it if you follow me here and on Facebook! Psst - Big giveaway when I reach 100 followers - pass it along. My bathroom is nothing special. It's nice, it's clean, it functions really well, but there's not a lot of pizazz in there. No one else sees it but my husband and me, and occasionally the kids, so why spend a lot money in there, at least while there's other rooms to do. A year or so ago, I did spruce up a little and brought some actual decorations in, a little color, and last year for Christmas Bill gave me new pretty towels, three sets, (yes, he's a very practical man. c:) We each have our sinks (best idea ever!) and I realized the other day, that mine was looking pretty cluttered, 4 different kinds of lotions, this tin bucket that seemed to keep an endless supply of junk, and a sad, sad little jar for q-tips that I'd had for seriously well over 20 years - the bottom had even fallen off and I hot glued it back on. Ugly little corner. I decided I need to do some sprucing up. I'd seen several tutorials for the cute, easy apothecary jars so that was the first order of business. A little trickier than I thought since my mirror is so low and there's not much space in that corner. I scored a few deals, a little candle holder on clearance from Michaels for $1.75 and the little jar for $.50 at a local printing/wedding supply store. Add a little glue and I have my apothecary jar. I cleaned out the pink bucket and was amazed at what I found. A couple sample sizes of Johnson's baby shampoo (um, I haven't had a baby for 6 years! ), an old watch, a paint brush, various kids toys, in other words a bunch of garbage. I thought it was being useful all this time and that I'd have to find something to replace it. Ha! I don't think so. Then while browsing our local thrift store, I came across this awesome pewter tray for $1.75. Score!! This is a nice tray. Realized later that it was the last perfect addition to my corner. So there it is, my nice, clean, pretty little corner. Is it that big of deal, no, but it makes me happy when I see it. Plus, added bonus, I don't pile the junk on it and it makes me want to keep my counter free of all clutter (curling iron, straightener, makeup, etc.) because now it looks nice. So grand total for my little corner of loveliness - $3.75. So worth it! Do you have any corners/areas in your house that could benefit from a little sprucing up? Or have you prettied up an area that just makes you smile every time you see it? On Saturday morning, Bill wanted all the kids outside first thing to help dig up all the potatoes in our garden. (I was heading to the church for a fun-filled craft day, part of which I was teaching.) I told the kids to put on their work clothes (i.e. not good school clothes), plus it was still a chilly morning. So Chloe comes down the stairs in her good capris, flip flops, and this super cute shirt, inside-out and backwards. She is 6, don't quite know what was going on with the shirt. Anyway, as I was taking her back upstairs telling her EXACTLY what she should wear, I realized I never posted about her super cute shirt I made. Did a little scan through the pictures and realized, yes, I took pictures for it and everything and never posted. So here it is, the transformation of a dress into a shirt. Before - Chloe in her modeling pose, I guess. This was one of Chloe's very favorite dresses, mine too, for that matter. I was so sad as I realized it was too short to wear to church anymore. I couldn't give it up. It sat in her closet for a few weeks, then in my sewing pile for a few more weeks, just waiting for inspiration to strike. Then it came as I was visiting Make it and Love it and came across this tutorial. Perfect!! Basically, you cut the dress off to the length you want (plus enough for a hem.) Have your subject try on the shirt and mark where you want the waist. Remember, as I found out the hard way, after your shirt is gathered with the elastic, it will ride up a little more so take that into consideration when marking the waist. Then you cut a 1" strip of material from the leftover dress. You're going to make a casing for the elastic with this strip. Pin the strip onto where you marked the waist (on the inside of the shirt) and sew close to the edge, leaving a small 2" opening on the bottom. Cut a piece of 1/2" elastic just a little bigger than your subjects waist, you want it to gather up, but not be tight. Pin a safety pin on one end of your elastic (great tip for threading elastic or anything else) and start feeding it through the opening. Once it's all the way through, overlap the two ends and stitch on top of them. Work the elastic the rest of the way through and adjust all your gathers. Have your little girl try it on and admire your crafty genius! Then call all your friends and family and tell them how awesome you are. Oh, is that only me who does that? It really is pretty darn simple again check out Make It and Love It if you need more detailed instructions with great pictures. She also shows you how to make short sleeves out of long sleeves. After - Yup, still striking a pose. I would love it if you Follow me here and Like me on Facebook! This past week was a little crazy, that's why I only ended up with one post. 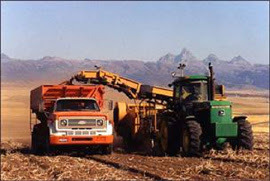 See my kids were out of school for Spud Harvest. What's that you say? Well, here in Idaho, potato country, the kids always get a fall break in order for them to help with the harvesting of potatoes. Back in my day, it used to be a full two weeks, but then, a lot more kids were actually working in the spuds. Now, it's more of a vacation week, with a very few helping with the harvest. So we're grateful for a nice week and a day of fun. We had one nice weather day in which we ripped out what was left in our garden. The little four started swimming lessons - Billy is a little fish! Maddie tries really hard and does a lot of splashing. It took some practice, but Chloe and Jon will now put their heads under water. All four made HUGE improvements since their first lesson, yeah! The kids had a sleepover at my parents house including donuts for breakfast (big hit!) Wednesday and Thursday we had a little preview of winter and got a good couple of inches of snow. Billy, Chloe, Maddie, and Jon even went out and built snowmen. So here's my newest favorite cookie, which was a HUGE hit with all the kids at my house on Monday. Bill almost didn't get any by the time he got home from work, oh, and I doubled the batch, too. This recipe comes from How Sweet It Is. Preheat oven to 325 degrees F. Add butter and peanut butter to a microwave safe bowl, and heat in 30 second increments until melted. (Took about 1 1/2 min.) Let cool completely. Mix the flour and baking soda in a bowl and set aside. In another bowl, mix the cooled butter/peanut butter and sugars until they are combined. Add the egg, egg yolk, and vanilla and stir until mixed. Gradually add flour and mix until a dough forms – it will look crumbly at first, but it will come together. (Mine wasn't crumbly at all.) I even used my hands to bring it all together. If necessary, add 1-2 teaspoons of milk, but I did not need this. Fold in chocolate chips. Shape the dough into a ball the size of a golfball. (I went for more of walnut shaped, just a little smaller, made more cookies and they were still big.) Place on a baking sheet two inches apart and bake for 10-12 minutes or until the edges are slightly brown. The centers should be soft and puffy. Do not over bake. Let cool completely then dig in! Oh, so very, very yummy!! 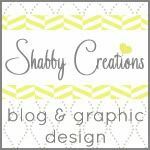 Amy at One Artsy Mama has so kindly featured my blog on her facebook page. Thanks to Leslie again, for her cute costumes post! 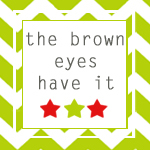 Today, I have a special treat for you, a guest post from my awesome little sister! Leslie and I are the two youngest in the family. We shared a room together, played Barbies for hours on end, she'd sleep on my shoulder on the hour long bus ride home from school, attempted to share clothes (but that didn't work so well, someone always stained my clothes c: ), were in high school together which meant stops for milkshakes on the way home from school and so much more. She's even partly responsible for my husband and I getting together. Now she's all grown up and is the mother to 3 cute boys (who are very close to the same ages of my boys) and sadly lives four hours away from me. However, they all come to visit often and we always have a great time together. Another couple of things you need to know about Leslie is she's very creative, loves to do art and all kinds of projects with her boys, and she's an incredible sewer (she'll share more of these talents later.) Check out her website Cornflower Attic for super cute bags, little girl dresses, and more. Anyway, Leslie always comes up with super cute costumes for the whole family. So I asked her to come and share her awesomeness with you all. Take it away, Les! I'm all about getting creative (and cost effective) when it comes to Halloween costumes. If I can make something from items I already have, and save $20 per costume, great! Here are a few ideas I've used over the past few years that might get your costume-making creative juices flowing. When I made these costumes, I was pregnant with our second child and decided Halloween was the time to make our big announcement. 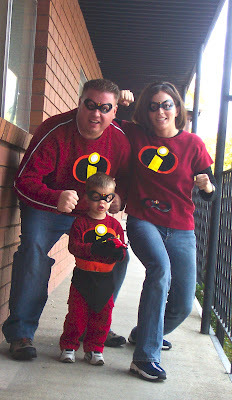 I didn't know at the time if I was having a boy or girl, but we were pretty sure if it was a boy, we were going to name him Jack, so that started our Jack-Jack/Incredibles theme (plus my then two-year-old was a big Incredibles fan at the time). (Sorry. These pictures are a few years old and not great quality). Anyway, these were super easy to make and a fun theme. For the logo, I drew an oval on scratch paper, a second oval a little bigger than the first, and then on separate pieces of paper, the "I" and dot for the "I." I traced them a time or two until I got the proportions correct, then cut out the paper, and used it for the patterns to cut out the felt. I used a hot glue gun to glue the pieces of the logo together and then used safety pins to secretly attach the logo to our shirts. The eye masks were a in a birthday package from Walmart. My husband and I borrowed Fred and Wilma Flintstone costumes from a friend, and I decided we needed a baby dinosaur. I already had the green baby sleeper for the base of the costume. I cut orange felt circles and sewed them all around the costume including a big one in the center to cover up the moose graphic on the sleeper. The sleeper came with a green hat, but I needed to spice it up a little. I bought a dog costume headpiece at Target, cut the dinosaur spikes off and glued them to my green hat. Here is my baby dinosaur emerging from his baby sling egg. I didn't make the Wilma costume, but it would be simple to put together. Lots of white felt with one seam on the side. The top has a slanted neckline and the bottom was cut in a zigzag. The lovely necklace is made with white pom-poms. Our theme for this year started when my oldest son deciding that he wanted to be Zurg from Toy Story for Halloween. 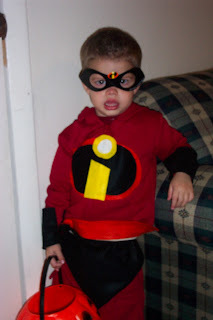 I started dreaming up great costumes for the rest of us and had a whole theme going on when my son then changed his mind about 4 times between October 1st and October 31st! He finally decided (two days before Halloween) on an army guy, which luckily still worked great into the whole Toy Story theme. For Mr. Potato Head, I started with brown felt. I cut a big, boxy, potato shape that would fit my then, one-year-old. I cut the same shape twice and sewed the two pieces together around the side edges, leaving holes for his arms and head. I did not sew the bottom together so his feet could be free to move, walk sit, etc. To make him a little bulkier, I turned the costume inside out, placed a handful of batting on each side seam, and glued a piece of felt around the batting to keep it in place. Next, I found pictures of Mr. Potato Head online, copy and pasted them into Microsoft Word, enlarged them to about the right size for the costume, printed them, cut them out, and then cut the same shape out of felt. Then, I hot glued the facial shapes right onto the brown potato shape. I know, I know, my kids aren't going to enjoy Mom and Dad dressing up with them for long, so I better make it good while I can! Last year we went with a Harry Potter theme. You might notice an addition to the Hogwarts crew. My middle son likes to be his own man from time to time, and this year he decided to be Luigi with his cousin who was Mario. Yea for four-year-old independence! I got this cute owl idea from the blog U Create. I followed their instructions listed here. It was really easy and I was happy with the way it turned out. When my sister-in-law heard he was going to be an owl, she whipped up this little hat for him. Well, I hope these ideas have got you thinking about things you might have on hand to make some fun costumes for this year. I am currently trying to figure out how to get my hair to stay in cinnamon roll buns for this year's costume and how to transform my husband into Han Solo (he insists he is not wearing skinny jeans). Have you seen any good jedi tutorials? Thanks for reading! See, isn't she so creative!! And that her husband, Luke, goes along with the dressing up is so cool, my husband will not. :) Hope that gives you some great ideas for this year's festivities. Since this is kind of just a general overview of the costumes, Leslie said she would be happy to answer any specific questions you have. Feel free to email me (address in my profile) and I'll pass them along to her.